Aristotle argued against the idea of a first cause, often confused with the idea of a "prime mover" or "unmoved mover" (πρῶτον κινοῦν ἀκίνητον or primus motor) in his Physics and Metaphysics. Aristotle argued in favor of the idea of several unmoved movers, one powering each celestial sphere, which he believed lived beyond the sphere of the fixed stars, and explained why motion in the universe (which he believed was eternal) had continued for an infinite period of time. Aristotle argued the atomist's assertion of a non-eternal universe would require a first uncaused cause – in his terminology, an efficient first cause – an idea he considered a nonsensical flaw in the reasoning of the atomists. Like Plato, Aristotle believed in an eternal cosmos with no beginning and no end (which in turn follows Parmenides' famous statement that "nothing comes from nothing"). 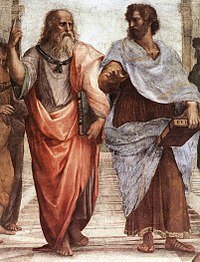 In what he called "first philosophy" or metaphysics, Aristotle did intend a theological correspondence between the prime mover and deity (presumably Zeus); functionally, however, he provided an explanation for the apparent motion of the "fixed stars" (now understood as the daily rotation of the Earth). According to his theses, immaterial unmoved movers are eternal unchangeable beings that constantly think about thinking, but being immaterial, they are incapable of interacting with the cosmos and have no knowledge of what transpires therein. From an "aspiration or desire", the celestial spheres, imitate that purely intellectual activity as best they can, by uniform circular motion. The unmoved movers inspiring the planetary spheres are no different in kind from the prime mover, they merely suffer a dependency of relation to the prime mover. Correspondingly, the motions of the planets are subordinate to the motion inspired by the prime mover in the sphere of fixed stars. 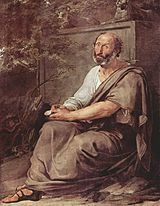 Aristotle's natural theology admitted no creation or capriciousness from the immortal pantheon, but maintained a defense against dangerous charges of impiety. Steven Duncan writes that it "was first formulated by a Greek-speaking Syriac Christian neo-Platonist, John Philoponus, who claims to find a contradiction between the Greek pagan insistence on the eternity of the world and the Aristotelian rejection of the existence of any actual infinite". Referring to the argument as the "'Kalam' cosmological argument", Duncan asserts that it "received its fullest articulation at the hands of [medieval] Muslim and Jewish exponents of Kalam ("the use of reason by believers to justify the basic metaphysical presuppositions of the faith"). Importantly, Aquinas' Five Ways, given the second question of his Summa Theologica, are not the entirety of Aquinas' demonstration that the Christian God exists. The Five Ways form only the beginning of Aquinas' Treatise on the Divine Nature. In the scholastic era, Aquinas formulated the "argument from contingency", following Aristotle in claiming that there must be something to explain why the Universe exists. [dubious – discuss] Since the Universe could, under different circumstances, conceivably not exist (contingency), its existence must have a cause – not merely another contingent thing, but something that exists by necessity (something that must exist in order for anything else to exist). In other words, even if the Universe has always existed, it still owes its existence to an uncaused cause, Aquinas further said: "... and this we understand to be God." The German philosopher Gottfried Leibniz made a similar argument with his principle of sufficient reason in 1714. "There can be found no fact that is true or existent, or any true proposition," he wrote, "without there being a sufficient reason for its being so and not otherwise, although we cannot know these reasons in most cases." He formulated the cosmological argument succinctly: "Why is there something rather than nothing? The sufficient reason ... is found in a substance which ... is a necessary being bearing the reason for its existence within itself." Therefore, the explanation of the universe's existence is God. Craig states that the only disputable statements are 1. and 2. He defended 1. from the question of "What caused God?" by saying that God cannot be caused by anything, as that would imply that there is something greater than him, which is logically contradictory. He also denied that the universe was an exception to the rule, claiming that such a proposition begs the question. He states  that saying 2. is wrong contradicts modern science, and that, far from not being specific to the God of Christianity, it actually leads to evidence specifically linking to a being outside of space and time, as well as one that is omnipotent and omniscient. In esse (essence) is more akin to the light from a candle or the liquid in a vessel. George Hayward Joyce, SJ, explained that, "where the light of the candle is dependent on the candle's continued existence, not only does a candle produce light in a room in the first instance, but its continued presence is necessary if the illumination is to continue. If it is removed, the light ceases. Again, a liquid receives its shape from the vessel in which it is contained; but were the pressure of the containing sides withdrawn, it would not retain its form for an instant." This form of the argument is far more difficult to separate from a purely first cause argument than is the example of the house's maintenance above, because here the First Cause is insufficient without the candle's or vessel's continued existence. It is produced by itself, something or another. Not by nothing, because nothing causes nothing. Not by itself, because an effect never causes itself. If A is first then we have reached the conclusion. If A is not first, then we return to 2). From 3) and 4), we produce another- B. The ascending series is either infinite or finite. An infinite series is not possible. Scotus deals immediately with two objections he can see: first, that there cannot be a first, and second, that the argument falls apart when 1) is questioned. He states that infinite regress is impossible, because it provokes unanswerable questions, like, in modern English, "What is infinity minus infinity?" The second he states can be answered if the question is rephrased using modal logic, meaning that the first statement is instead "It is possible that something can be produced." William Lane Craig, who famously uses the Kalam cosmological argument, argues that, as the infinite is impossible, whichever perspective the viewer takes, there must always have been one unmoved thing to begin the universe. He uses Hilbert's paradox of the Grand Hotel and the question 'What is infinity minus infinity?' to illustrate the idea that the infinite is metaphysically, mathematically, and even conceptually, impossible. Other reasons include the fact that it is impossible to count down from infinity, and that, had the universe existed for an infinite amount of time, every possible event, including the final end of the universe, would already have occurred. He therefore states his argument in three points- firstly, everything that begins to exist has a cause of its existence; secondly, the universe began to exist; so, thirdly, therefore, the universe has a cause of its existence. A response to this argument would be that the cause of the universe's existence (God) would need a cause for its existence, which, in turn, could be responded to as being logically inconsistent with the evidence already presented- even if God did have a cause, there would still necessarily be a cause which began everything, owing to the impossibility of the infinite stated by Craig. Secondly, it is argued that the premise of causality has been arrived at via a posteriori (inductive) reasoning, which is dependent on experience. David Hume highlighted this problem of induction and argued that causal relations were not true a priori. However, as to whether inductive or deductive reasoning is more valuable still remains a matter of debate, with the general conclusion being that neither is prominent. Opponents of the argument tend to argue that it is unwise to draw conclusions from an extrapolation of causality beyond experience. Andrew Loke replies that, according to the Kalam Cosmological Argument, only things which begin to exist require a cause. On the other hand, something that is without beginning has always existed and therefore does not require a cause. The Cosmological Argument shows that there cannot be an actual infinite regress of causes, therefore there must be an uncaused First Cause that is beginningless and does not require a cause. The usual reason which is given to refute the possibility of a causal loop is it requires that the loop as a whole be its own cause. Richard Hanley argues that causal loops are not logically, physically, or epistemically impossible: "[In timed systems,] the only possibly objectionable feature that all causal loops share is that coincidence is required to explain them." However, Andrew Loke argues that causal loop of the type that is supposed to avoid a First Cause suffers from the problem of vicious circularity and thus it would not work. Nevertheless, David White argues that the notion of an infinite causal regress providing a proper explanation is fallacious. Furthermore, Demea states that even if the succession of causes is infinite, the whole chain still requires a cause. To explain this, suppose there exists a causal chain of infinite contingent beings. If one asks the question, "Why are there any contingent beings at all? ", it does not help to be told that "There are contingent beings because other contingent beings caused them." That answer would just presuppose additional contingent beings. An adequate explanation of why some contingent beings exist would invoke a different sort of being, a necessary being that is not contingent. A response might suppose each individual is contingent but the infinite chain as a whole is not; or the whole infinite causal chain to be its own cause. Severinsen argues that there is an "infinite" and complex causal structure. White tried to introduce an argument "without appeal to the principle of sufficient reason and without denying the possibility of an infinite causal regress". A number of other arguments have been offered to demonstrate that an actual infinite regress cannot exist, viz. the argument for the impossibility of concrete actual infinities, the argument for the impossibility of traversing an actual infinite, the argument from the lack of capacity to begin to exist, and various arguments from paradoxes. ^ a b c d Reichenbach, Bruce (2012). "Cosmological Argument". The Stanford Encyclopedia of Philosophy (Fall 2006 Edition, Edward N. Zalta (ed.) ed.). Retrieved 4 August 2016. ^ Craig, William Lane; Sinclair, James D. (May 18, 2009). "The Kalam Cosmological Argument". In Craig, William Lane; Moreland, J. P. The Blackwell Companion to Natural Theology. Wiley-Blackwell. pp. 101–201. ISBN 978-1405176576. ^ Koons, Robert (1997). "A New Look at the Cosmological Argument" (PDF). American Philosophical Quarterly. University of Illinois Press. 34 (2): 193–211. ^ Craig, WL., The Cosmological Argument from Plato to Leibniz, Wipf and Stock Publishers, 2001, pp. 1–5, 13. ^ Aristotle, Physics VIII, 4–6; Metaphysics XII, 1–6. ^ "Cosmological Argument for the Existence of God", in Macmillan Encyclopedia of Philosophy (1967), Vol. 2, p. 233 ff. ^ Duncan, S., Analytic philosophy of religion: its history since 1955, Humanities-Ebooks, p.165. ^ Aquinas was an ardent student of Aristotle's works, a significant number of which had only recently been translated into Latin by William of Moerbeke . ^ Monadologie (1714). Nicholas Rescher, trans., 1991. The Monadology: An Edition for Students. Uni. of Pittsburg Press. Jonathan Bennett's translation. Latta's translation. ^ Joyce, George Hayward (1922) Principles of Natural Theology. New York: Longmans Green. ^ Clarke, WN., "A Curious Blind Spot in the Anglo-American Tradition of Antitheistic Argument", in The Creative Retrieval of Saint Thomas Aquinas: Essays in Thomistic Philosophy, New and Old, Fordham Univ Press, 2009, Ch. 5. ^ Andrew Loke, God and Ultimate Origins (Cham: Springer Nature, 2017), p. 189; Chapter 5. ^ Andrew Loke, God and Ultimate Origins (Cham: Springer Nature, 2017), chapter 4. ^ Rota, Michael. "Infinite Causal Chains and Explanation" (DOC). Proceedings of the American Catholic Philosophical Association. ^ Severinsen, Morten. "Principles Behind Definitions of Diseases – a Criticism of the Principle of Disease Mechanism and the Development of a Pragmatic Alternative". Theoretical Medicine and Bioethics. This implies that there is an "infinite" and complex causal structure behind each disease, and that the disease mechanism would have to encompass the whole structure. ^ White, David E. "An argument for God's existence". International Journal for Philosophy of Religion. My intention is to show that a cosmological argument for God's existence (not that of a first cause simpliciter) can be constructed without appeal to the principle of sufficient reason and without denying the possibility of an infinite causal regress. ^ Andrew Loke, God and Ultimate Origins (Cham: Springer Nature, 2017), chapters 2 and 3; Waters, Ben. 2013. "Methuselah's Diary and the Finitude of the Past". Philosophia Christi 15: 463–469; Koons, Robert. 2014. A New Kalam Argument: Revenge of the Grim Reaper. Noûs 48: 256–267. ^ Folger, Tim. "Time may not exist". Retrieved August 17, 2012. ^ Britt, Robert R. (April 18, 2001). "Brane-Storm | Challenges Part of Big Bang Theory". Space.com. Archived from the original on 11 May 2008. Retrieved June 21, 2008. ^ Benjamin Victor Waters (9 July 2015). "Toward a new kalām cosmological argument". Cogent Arts and Humanities. 2 (1). doi:10.1080/23311983.2015.1062461.